When you are preparing to graduate, you have lots of options. This series highlights people who chose service, and how the volunteer experience has made an impact on their lives. How did you first learn about post-graduate service? I learned about post-graduate service through friends and role models of mine who have done post-graduate service. Tell us about your service experience. I serve as a Child Care Aide in the Bon Secours Early Head Start Child Development Classroom. In my role I work as part of a team serving children ranging in age from two months to three years old and their families. This program helps support families and children so that they can develop a love of learning to carry with them throughout their lives. 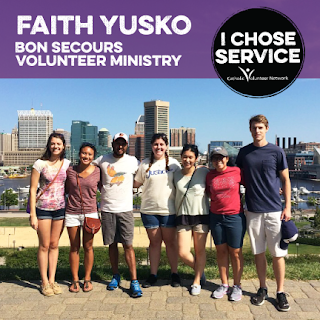 My fellow volunteer community members and I live and serve in West Baltimore, and have been learning from the pillars of our program centered around practicing God’s justice, learning through service with others, developing community, growing spiritually, and living simply. In addition to allowing me to share my gifts, my service year has humbled me through the community I am learning from and that I am a part of. What advice do you have for someone considering post-graduate service? Take the leap of “Faith” and you won’t regret it! There are opportunities to learn and grow through service each day! To learn more about post-grad service opportunities, check out our RESPONSE directory, listing thousands of opportunities across the United States and abroad. I Chose Service: Gina Fleck, Project S.E.R.V.E.